With a draft proposal for streamflows in the Sacramento River expected by the end of the year, farmers in the basin had a chance to discuss the plan with state regulators during a Sacramento Valley Water Summit organized by the Colusa County Farm Bureau. The State Water Resources Control Board proposal for the Sacramento and its tributaries represents the second phase of an overall plan to increase flows for salmon and other protected fish. Phase 1, involving San Joaquin River tributaries, could be finalized by the board Dec. 11. The San Joaquin tributaries plan would require an average of 40 percent of water, and a maximum of 50 percent, to be left as “unimpaired flow” for fish; a framework plan for the Sacramento and its tributaries seeks unimpaired flows of 45 to 65 percent. During the summit meeting in Williams last week, state water board Chair Felicia Marcus and Department of Fish and Wildlife Director Chuck Bonham participated in a panel discussion that also featured elected officials and representatives of farmers and irrigation districts. 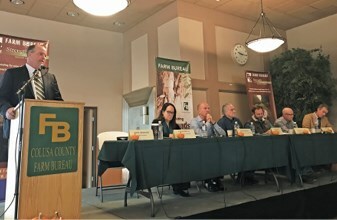 California Farm Bureau Federation President Jamie Johansson, who moderated the discussion, said the regulatory proposal could severely restrict longstanding water rights in the Sacramento Valley and diversions from reservoirs and rivers. “We (stand to) lose a lot of agricultural production and there will be severe impacts, not just to the farm economy, but to the urban economy,” Johansson said. Farmers “want to be part of the solution,” he said, while emphasizing the importance of the state water-rights system. “Everyone benefits from water rights,” Johansson said. Marcus and Bonham stressed the importance of cooperative actions. Bonham said he supports the concept of “functional flows”—scheduling streamflows at the appropriate amounts and times—and noted other variables affecting fish that must be addressed, such as water temperature, timing of base flows, habitat restoration, predation and more. “I can commit our department to things that you’ve been pushing us to do,” Bonham said, adding that his department is “ready and willing to dedicate staff and money” to addressing non-native predator fish and habitat restoration. “We are willing to negotiate an outcome,” he said, noting that he and Sacramento Valley water leaders have been discussing an agreement that integrates flow and non-flow measures. Northern California Water Association President David Guy said a 50 percent unimpaired flow range for the Sacramento River would lead to significant impacts for water diversions and reservoir storage. He emphasized benefits of the Sacramento Valley Water Plan update, in which flow has been re-managed on every system in the basin to benefit salmon. Guy called the approach “the new way forward,” which includes improving conditions for salmon through investments in non-flow restoration measures in combination with lesser volumes of strategically targeted functional flows. He said the strategy would also reduce the impacts on groundwater pumping and therefore help in implementing the state Sustainable Groundwater Management Act. Assembly Member James Gallagher, R-Yuba City, said the Sacramento Valley farming community has always been willing to find compromises to ensure the long-term sustainability of the communities and the reliability of water. State Sen. Jim Nielsen, R-Red Bluff, said billions of dollars and billions of gallons of water have been “poured into the delta” in efforts to save the fishery, and asked regulators to reconsider their plans for further flow-based measures. “Before we do this, we need some assurance this will work and a sunset on how long we’re going to play around with this to determine whether or not it works,” Nielsen said. He said water districts had invested $30 million on studies leading to a Tuolumne River Management Plan that includes further investment of $150 million in river improvements during the next three years. At a meeting earlier this month, the state water board delayed final action on the flow plan for the San Joaquin tributaries, after Gov. Jerry Brown and Lt. Gov. Gavin Newsom asked it to take more time to negotiate voluntary agreements with water users.